The now NAACP Image Award nominee and Billboards chart topping artist, was once humbled by homelessness after calling it quits from his famed group, "Nuttin but Stringz." The group, comprised of Damien and his brother, Tourie-- known in NYC for playing their violins on the subway; gained global recognition when they appeared as contestants on "America's Got Talent." The competition helped to catapult the duo into stardom and they quickly experienced all the highs of being the most sought after musicians of their time. However, that glory was short-lived and the fall from grace was a hard hit, to say the very least; as the group disbanded and a bruised Damien made the decision to retire his violin. What came next was a struggle-- not only with his identity, and depression, but with finding success in other non-creative endeavors. Looking back at his journey, Damien realizes it all needed to fall apart so he could be forced to grow while putting it back together the right way. Prevailing was a process and it started with unburying his talent-- his love of playing the violin. And in 2013 Damien released his first album as a solo artist, "Sensual Melodies." Once thought of as a passion project, the album garnished over 200K downloads; landed on the iTunes Top 100 chart; and served as a springboard for a successful national tour where he headlined, for the first time, as the one and only, Damien Escobar. From there, doors that were once closed, became a little easier to push open; affording Damien opportunities to tell his inspiring story to publications like People Magazine and Huffington Post; make appearances on local and national news including "The Today Show"; serve as a guest on radio broadcasts; and even accept invitations to perform at notable events such as Oprah Winfrey's "The Life You Want" tour. Back in the spotlight, Damien decided this time around he would do more with his visibility and began his entrepreneurial walk by penning and self- publishing his very first children's book, "The Sound of Strings"; building his very own line of custom designed violins; and establishing partnerships to develop a wine line, perfume and fragrances, and a non-profit organization that would include a music program for children. Motivated by his past and grateful for his fans and future, Damien went on to release his second album, "Boundless." Growing into a self-conscious artist with more than a mission to make good music, Damien sought to inspire change and spread positivity by sharing uplifting messages and telling unfiltered personal stories to sold-out arenas across the world during his second tour. Though he's achieved more than he could have imagined after pulling himself up by his bootstraps and kick starting his solo career-- Damien Escobar's story isn't over yet. 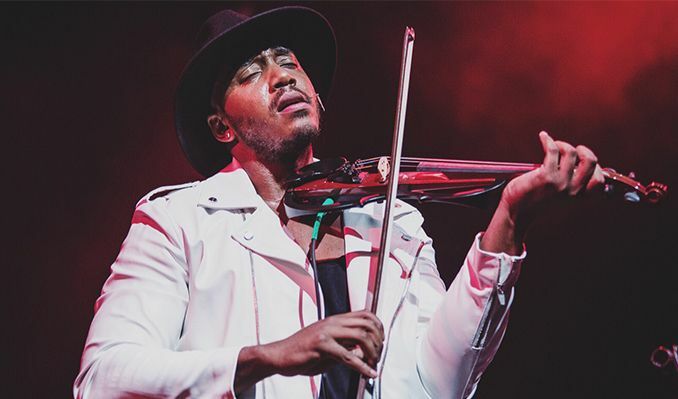 The breakout artist has partnered with Mitsubishi and is now the face and sound of their latest campaign; he's releasing new music and videos set to air on major broadcast channels; and, the world famous violinist, continues to build his brand centered around making an impact and inspiring social change. Stay tuned, there's more to come.